This class was so fun! I especially love how this project takes the focus off perfect lettering, and I think it's such a charming idea for little lettering pieces! 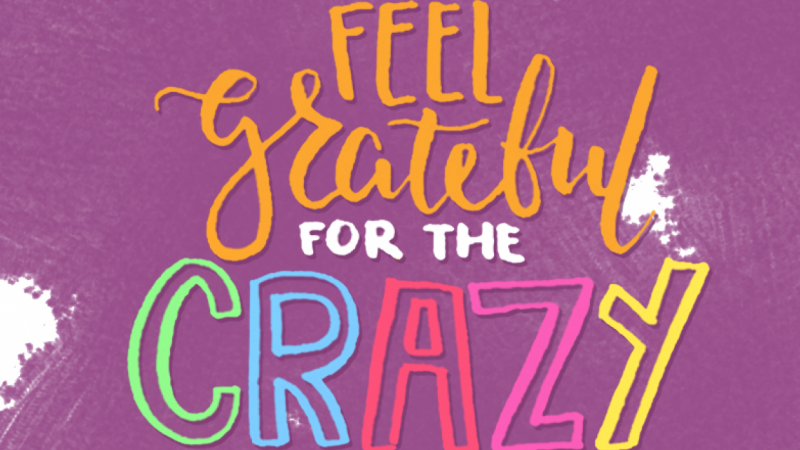 I decided to go with 'Feel grateful for the crazy', which recently has been in my head as a reminder to be thankful that I even have things in life that keep me busy (a job, side interests, time with family and friends), even though all these sometimes make me want to pull my hair out. I loved the tip about the gradient map, will definitely save that for future use. However, I decided I wanted to go with a mix of crazy colours instead. I still haven't decided if I like the colours, it looks slightly too crazy for me. Which I guess was what I wanted... so ok! I also took Jamie's tip about the changing textured backgrounds, love that idea!